Shelley Stracener is a 2005 Electrical & Computer Engineering graduate. She is currently working as an Engineering Program Manager for Heads Up Technologies, an aerospace, aviation and entertainment solutions company that specializes in designing lighting and cabin management systems for private jets and aircrafts. Shelley discusses her involvement in the Society of Women Engineers and her passion for networking through professional organizations. A: I currently work for Heads Up Technologies as an Engineering Program Manager. We provide innovative new products like cabin management systems and LED lighting for private business jets. In addition to schematic capture, PCB layout, hardware validation, and firmware design, I also manage project logistics and work with customers and vendors as we develop custom solutions for aircraft manufacturers. 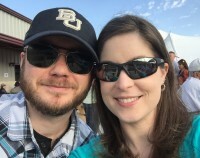 A: After I graduated from Baylor, I worked at Dell for five years. Unfortunately, there were not many opportunities to incorporate design work into my day-to-day responsibilities, so I decided to move on. I worked for a medical device company for a short period of time before the product I worked on was sold off. A fellow Baylor graduate approached me about a position at Heads Up Technologies, and I started working for the company in 2010. Heads Up Technologies is a small company consisting of 60 people, 25 of whom are design engineers. I was finally able to get more of the hands-on experience I was looking for. A: Because we work on private jets, there is a lot of custom work. It can be a challenge to implement the customer’s requests in a cost-effective manner. In addition, we have many projects where we are only designing a part of the cabin management system, and we have to make our part work with the aircraft’s existing system. Those projects require a good amount of communication with the customer and other vendors to ensure that everything works together. A: Occasionally, we get to go on test flights when we do certifications on the aircraft’s components. It is really cool to be sitting on a plane next to something you have designed. I always love to see the finished product. A: The younger generation is more in tune with technology, and there has been a shift in how the general population uses technology in their daily lives. However, not everyone is as familiar with new technologies as the younger generation. For example, when designing touch-screen menus, not everyone is going to find the same user graphical user interface design intuitive and easy to use. User experience is important, but highly subjective. For this reason, we make a lot of our technology customizable so that customers can pick and choose the features they prefer to use. This strategy accommodates a wider range of potential users. I’ve observed a lot of profitable and innovative things happening on the software side of the industry as engineering companies start to take a holistic look at things like usability and customer experiences. It’s very easy for engineers to put blinders on and make assumptions about how a device will be used. However, I think it’s important to think about usability from a customer’s perspective so that you can work out bugs, prevent misuse, and implement features that would otherwise be overlooked or dismissed. A: I really liked Electrical Materials with Dr. Eisenbarth. When I came to Baylor, I wanted to be a pharmacist. Electrical Materials combined chemistry and physics and applied those fundamentals to the engineering problem-solving process. It suited my interests and ultimately helped lead me to a career in engineering. In 2004-2005, the economy was really struggling. A lot of companies had hiring freezes, and I wasn’t able to complete an internship before graduation. As a result, I didn’t really know what to expect when I graduated. My first year out of college was a bit shocking as I adjusted. I wish that I had taken the time to attend a regional or national conference with a professional organization. This would have given me the opportunity to go to a career fair and talk to professionals about what they do all day, what they like and dislike about their current job, and what keeps them motivated. I think I would have had a better understanding of what to expect after graduation had taken advantage of some of those networking opportunities. A: Most of my memories are of late nights at the lab. They seemed impossibly hard at the time, but looking back they were much easier than what I do now! I really enjoyed my experiences in Senior Design where I led the project for part of the semester and worked with other students. We solved engineering problems together but also made important connections with one another. These connections helped me after college in my job search. A lot of small companies will not always post jobs publicly. They often ask their current employees, and hires are made through networking. That’s how I ended up at Heads Up Technologies. Q: You were a member of The Society of Women Engineers as a student at Baylor, and you remain active as a professional. What is your current role in SWE? A: I have been a SWE member since 2002. I am currently a Section Representative and the webmaster for the Dallas Section of SWE. I also manage the website and all of the social media channels for SWE Region C which is comprised of members in Texas, Louisiana, Alabama, and Mississippi. In these roles, I get to meet a lot of people from all over the United States and serve the members of Region C and Dallas as a conduit of information from the international society. Q: How has your involvement in SWE and other professional organizations helped you in your career? A: Through SWE and IEEE, I have met a lot of other local engineers. This has helped me expand my professional network and participate in community outreach events. It has also helped me stay fresh on new technologies and the future of different industries through webinars, conferences, and other professional events. Technologies change so quickly: it is important to be a life-long learner and seek out opportunities to develop leadership skills. A: I would tell current students to seek out leadership positions right away in their careers with their company and with professional organizations. Nobody is going to volunteer you for a leadership role. Take the initiative. Put yourself out there, and don’t be afraid to take on more responsibility. Even the jobs that no one else wants will help build your reputation as a problem-solver. Show yourself as an enthusiastic and confident leader, and others will think of you when opportunities come along. If all you do is your nine to five and go home, you can unintentionally trap yourself by missing out on other opportunities. Stay involved. A: I am an avid cyclist, and I have participated in the MS 150 for the past 12 years. I also enjoy sewing, scrapbooking, and spending time with my husband and our two dogs.